I continue my discussion of noteworthy adaptations of the short story The Gift of the Magi, a Christmas tale written by the great American author O.Henry. Out of the dozens of TV and movie versions of O.Henry's account, so far I've shared the 1952 film O.Henry's Full House, the 1978 TV movie The Gift of Love, a segment within 1999's Mickey's Once Upon a Christmas, Jim Henson Production's 1977 hit Emmet Otter's Jug-Band Christmas, the 1996 operatic TV version from Finland entitled The Gift of the Magi, the sitcom Alice from a 1979 episode, the 1974 Christmas episode of the family drama Little House on the Prairie, the 1955 Christmas episode of The Honeymooners, and an anti-Gift of the Magi story from the TV sitcom Everybody Loves Raymond. Debuting in 2010, this TV movie stars Marla Sokoloff as Della Alexander and Mark Webber as Jim Alexander. Though O.Henry's short story was originally written and published more than one hundred years ago, adaptations continue to be made. 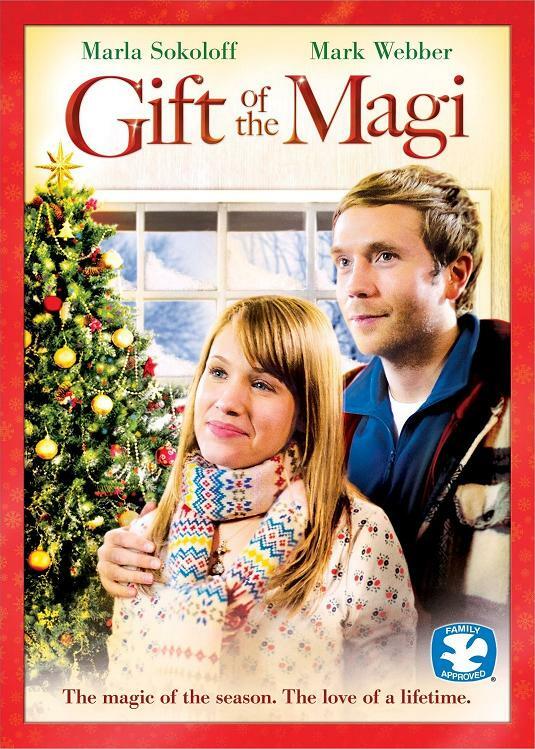 In 2010, a feature length version debuted on the Hallmark Channel directed by Lisa Mulcahy. The Christmas story continues to remain a popular one as the movie was re-broadcast on the Hallmark Channel during the holiday season in both 2011 and 2012. Have you seen this one before? The story begins with the newlyweds moving in together after their wedding. Newlyweds Jim and Della Alexander are excited to spend their first Christmas together. Though money is tight, each has plans to buy a special Christmas present for the other. After their car is stolen and they have to buy a new one, they promise each other no gifts this year for the holiday. 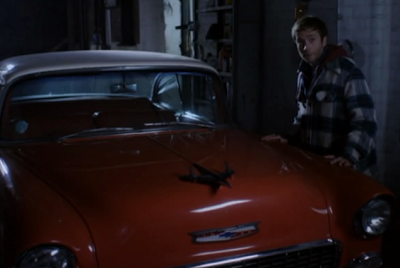 Jim spends all his free time working to restore a 1955 Chevy Bel Air, a car that reminds him of his father. Della has already made plans to buy Jim a hard-to-find steering wheel for his vintage automobile he's restoring. She takes a second job doing laundry for a luxury hotel to earn the extra money for his gift. Meanwhile, Jim decides to break his promise and arranges to buy a special gift for his wife: a wide angle lens and a zoom lens for the camera that she loves to take pictures with. In the days leading up to Christmas, Jim begins to sense that Della is keeping secrets from him. Jim also discovers that his wife is lying to him about where she's been. The Alexanders' love and trust for one other begins to break when Jim accidentally sees his wife entering a local hotel with another man. When Jim confronts her about it, Della feels betrayed by his accusation of cheating and refuses to explain her actions. Della also feels hurt that Jim has been spending all his time working on his restoration job and ignoring her requests to decorate the Christmas tree and sit for a Christmas photo. Della's secret job is working in hospitality services for a luxury hotel. She hopes Jim never misses her as she will be working this 2nd job while Jim works evenings as a bartender. Apart and miserable for the holiday, Jim is staying with his best friend Ian while Della is staying with her best friend Reneé. Both Ian and Reneé know the truth of this misunderstanding and they set out to reunite the foolish young lovers. Jim and Della see how wrong and foolish they are when they recognize the sacrifices they made for each other. It's not until Reneé tricks her friend into returning to her own home does Della realize the 1955 Chevy is missing. Ian also persuades Jim to return home where he finds his wife calling the police about the missing vintage auto. Finally Jim confesses that he sold the car to buy Della the camera lenses--and Della confesses she took a second job to earn more money and pawned her camera to buy him an expensive and rare steering wheel for his car. There's a happy ending for this Christmas TV movie as the Alexanders realize they still love each other after all. Will Reneé and Ian ever find romance? 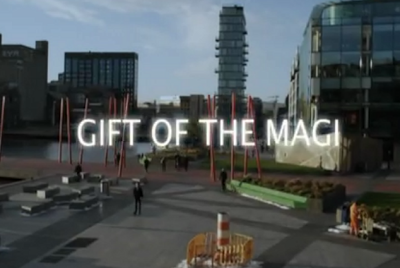 Everyone likes a happy ending in Christmas TV movies. This movie may not satisfy viewers looking for a faithful adaptation of O.Henry's original short story. Clearly much has been added--its modern day setting, Della's second job, Jim's accusations of adultery, and there's even a substantial romantic side story involving the best friends Ian and Reneé. However, these extra threads serve to pad or fill out the story, perhaps improving it for some contemporary audiences already familiar with original short story. The addition of the will-they-or-won't-they romance between Ian and Reneé is typical of most of the Christmas TV movies airing on the Hallmark Channel. But the essential elements of O.Henry's tale of love and sacrifice remain in this adaptation too. Who pays to go to the theater to see a recent TV movie? Have you ever noticed this before? In the scene where Jim and Della go to the movie theater to see A Christmas Carol, the movie poster is visible in the background. 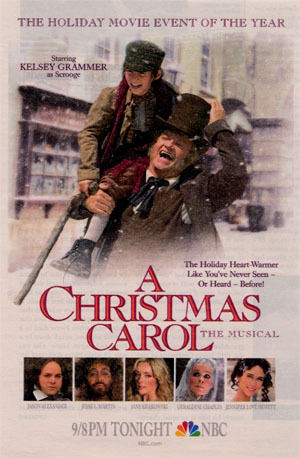 If I'm not mistaken--that's 2004's TV movie A Christmas Carol: The Musical starring Kelsey Grammer. When Jim is seated in the theater, you can hear Grammer's recognizable voice speaking Scrooge's dialogue. Since both movies Gift of the Magi and A Christmas Carol: The Musical are Hallmark Entertainment movies, I can assume this was a matter of licensing. But really, who pays to go to the movies to watch a 2004 TV movie? Is this the same poster design or what?